Looking for good recipes using puff pastry? This versatile dough can be used in a variety of sweet and savory dishes. Puff pastry is a French delight made from a dough that when it's baked, puffs into airy, flaky layers of golden pastry. Puff pastry is typically made with a flour and water dough that is layered with unsalted butter (or in some cases, lard). The process of making puff pastry takes a few days, several steps and a lot of patience. While you can make puff pastry yourself if you have the time and inclination, there are very good commercially prepared varieties available that will save you time and potential frustration. Look for commercial puff pastry in the freezer section of your grocery store near the frozen pie dough. In the absence of puff pastry, you can substitute phyllo dough. Working with puff pastry is not an easy task. It is necessary to handle the pastry with care. The more you handle puff pastry, the tougher and less flaky it becomes, so it is essential that you keep handling to a minimum and never knead the puff pastry. If using frozen puff pastry, thaw the pastry overnight in the refrigerator or thaw it on the counter for 45 minutes. Always work on a lightly floured surface and unfold the pastry dough. Gently blot any beads of moisture with a paper towel. If the dough cracks, push the pieces back together gently using your fingers. Roll pastry into a rectangle using a lightly floured rolling pin, rolling from the center outwards. Trim the pastry as needed for your desired recipes using puff pastry. Puff pastry is so versatile that there are actually many recipes in which you can use it. Beef wellington and berry tarts are but a few of the many options. One of the classic uses of puff pastry is beef wellington. This is an elegant and delicious entree to serve for a special occasion. Put tenderloin in a roasting pan and form it into a ring. Brush with one tablespoon of melted butter. Roast tenderloin about 40 minutes - until 120 degrees. Remove from oven and let stand 30 minutes. Leave the oven on. Thaw pastry as directed above. While pastry is thawing and beef is resting, heat 3 tablespoons of butter in a skillet. Add mushrooms, thyme, salt and pepper, cooking until mushrooms release liquid and liquid evaporates. Add red wine, scraping any bits up from the bottom of the pan. Cook over medium heat until the liquid evaporates. Remove from heat and cool slightly. Roll out one sheet of the pastry as directed above into a 14" x 12" rectangle. Carefully move the puff pastry to a large cookie sheet. Place the tenderloin on the dough. Spread the pate evenly over the top of the tenderloin, and then spread the duxelles (mushroom mixture) over the top of the pate. Trim the pastry to one inch surrounding the tenderloin. Beat egg white slightly and brush on the pastry that is showing under the tenderloin. Roll out your second sheet of pastry, and place it loosely over your ring of tenderloin, pressing the pastry into the base sheet of pastry to seal the edges. Crimp edges. If you like, you may make decorative pieces out of the trimmed pastry to place on top of the sealed pastry. Beat egg yolk with milk and brush on top and sides of pastry. Roast beef wellington in 425 oven for ten minutes. Reduce the heat to 375 and bake for an additional 20 minutes - until the crust is golden. Transfer to a platter and let stand while Bordelaise sauce is being prepared. In a medium saucepan, heat butter to bubbling and sauté shallots. Add in flour, stirring constantly. Stir until flour is lightly browned. Stir in liquids, stirring constantly until sauce boils. 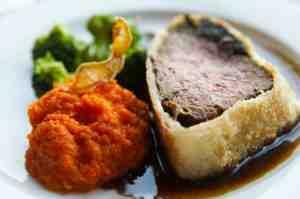 Serve sauce over sliced beef wellington. A simple fruit tart can be made using puff pastry cups, also available in your freezer section of the grocery store. Spoon berries into puff pastry cups. In a mixer, beat the whipping cream, sugar and vanilla until stiff. Spoon whipping cream over tarts.